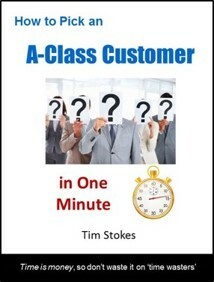 Marketing to A-Class Customers – FREE Book Reveals How! Picking them is EASY, when you know what you're looking for. They talk and behave in a certain way that you can determine while talking to them, yes even on the phone. People who know nothing about your industry are cautious, often scared, apprehensive and not trusting when talking to you on the phone. But A-Class marketing can change so prospects who see your marketing are "warmed" up to buy when they call your business. Knowledge displaces ignorance and without knowledge people are fearful, so quality marketing educates, not just informs people of what you do. A-Class customer marketing is a specialised skill very few website developers or online marketers develop. With it in place, you'd be amazed at how much your marketing can "pre-sell" prospects, so that when you talk to them they are "warm" to talk and more willing to trust you. What you do in the conversation from there (i.e. the sales process) will determine if they buy from your business (without comparing prices to other businesses), or they waste potentially hours of your time and still don't buy. The behaviour of people is an indication of their knowledge and that behaviour can be accurately and quickly identified in less than one minute (when you learn and apply what's in this book). To learn all about it, just grab our book on it by filling in your contact details below. As we like to work with A-Class customers, we like to know more about you than just your first name or email. Then we can give you much better information - to grow your business. * You'll also receive other free training books and webinar invitations to build your business with quality information.